Razor 1911, Cartel and Abnormal Party 1988 was held at The event was held at a school called Hals Ungdomsskole in Stjørdal near Trondheim, Norway for the C64 and Amiga scenes. 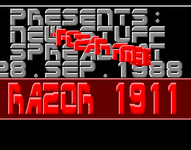 Being inspired from visiting Danish Gold copy parties in Denmark in 1987 and 1988, Sector9/Razor 1911 (amiga) took some friends with him from his own group as well as from Cartel (amiga) and Abnormal (c64) and created the first party in Norway of some notoriety. Main organizers were Sector 9, Dr. No/Razor 1911, ZTH/Abnormal, Pab/Cartel and Ozzy/Cartel. Reports vary, but it appears somewhere around 130 and 140 people visited the party, with the only foreign visitors from the neighbouring country of Sweden. Though the event was to officially open its doors on Friday 7th and stay open until Sunday 9th of October, the first visitors started arriving as early as Wednesday, and quite a few more on Thursday evening. Friday started shakily, with the event suffering power outages that were eventually fixed as the evening wore on. Come Saturday, a surprise visit was bestowed on the party visitors, when representatives of the local Police force showed up to check allegations that software was being illegally reproduced at the party. The visit was fairly brief and unspectacular, and noone were detained or suspected. It was later claimed that journalists for the computer publication Norsk Data Magazin had in fact called the Police about the event in order to create a more exciting story, and indeed the cover of the next issue featured a Police officer surrounded by prominent members of Razor 1911 and Abnormal and a sensationalist headline. Further clippings are available at the Slengpung link above. The party was also covered in a two-page spread in one of the largest national newspapers, Aftenposten. 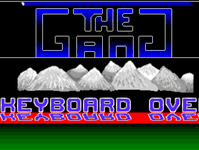 The event was as much for the Amiga as the C64, and demo competitions were held for both platforms. 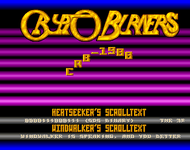 Norwegians claimed victory in both categories, with Rawhead clenching the victory in the C64 category with Partysqueezer+ (topping a playing field of 11 submissions), with the honors on the Amiga going to Arcadia Team for Vuku (out of 8 participating productions). Thanks a lot to Sector 9, InsaneTTM and Ziphoid for providing information on this party. Additional information from Cracker Journal 10 (november 1988) and Scandinavian News 5 (november 1988). The most complete C64 results are available in Iguana #3, where the party was listed as "Stjordal Demo Competition".